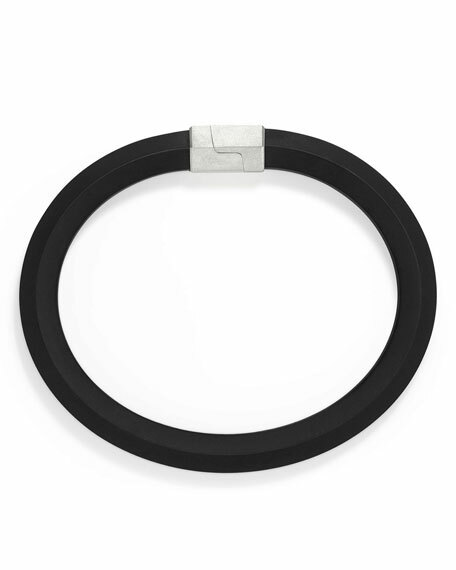 David Yurman men's bracelet from the Hex Collection. Rubber band with logo on inner side. 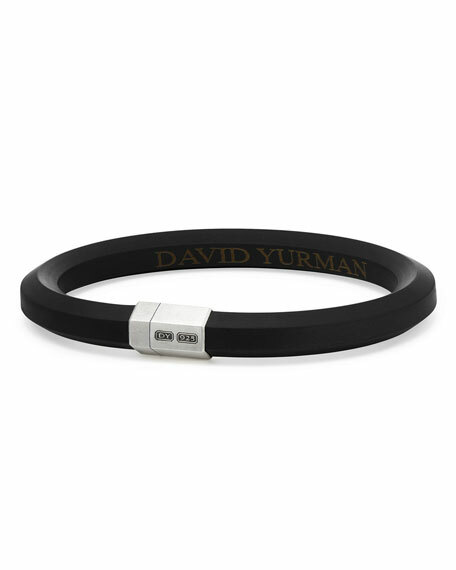 David Yurman men's bracelet from the Cable Classics Collection. Signature sterling silver cable cuff and settings. Two round black onyx as end caps. Approx. 6mm wide. David Yurman men's cuff from the Cable Classics Collection. Signature sterling silver with 18-karat yellow gold end caps. Split opening eases dress; slip-on style. Approx. 6mm wide. Sterling silver. Meteorite inlay; ID plate. 59mm x 10mm wide. Fold-over clasp. David Yurman beaded bracelet. Black woven fabric. Silvertone geometric beads. Woven clasp; adjustable length. "Fortune" is imported.